Over the years of crafting and upcycling, I have used many products. And unfortunately, they tend to accumulate and end up all over the place. Recently, I decided that this was just not working for me. What I needed was organization…and I needed it before I pulled all of my hair out. After gathering up all my supplies/products, I went through them all to recycle bottles that had dried up or had stuck around (even though they were empty.) 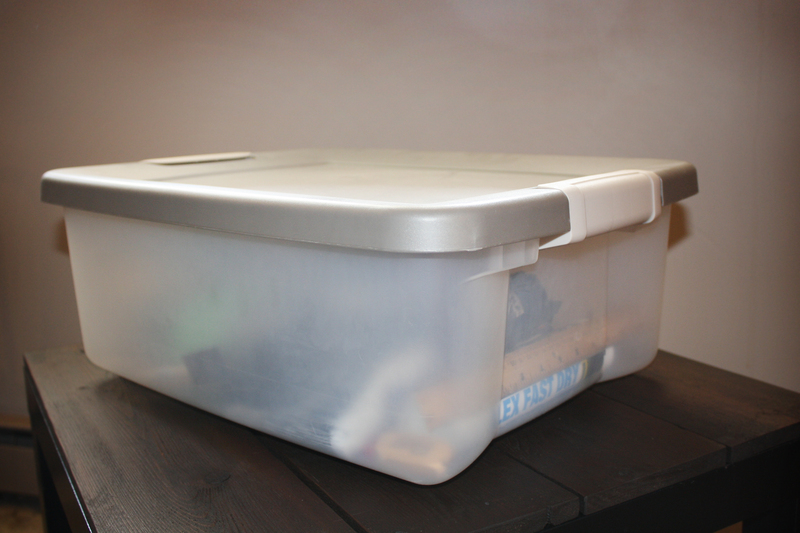 I organized and condensed what was usable, placing them in this large storage bin. If a product has made it’s way into my supply box instead of my dad’s garage, I’ve found it pretty useful. So I’d love to share them with you! Although, I’d like to point out that most of the tools that I use are my dad’s, and are rightly staying in his shop/garage. Also finding a home in his garage, are the many stains and jugs of paint that cannot fit in my limited space. Below are the items in my bin! Spray Paint – It is super versatile and can be used on almost anything. Currently in my box, I have red, gray, baby blue, and chalkboard paint. I always keep the can if there is any paint left, you never know when you’ll find a need for that color again. Liquid Paint Stripper – I originally bought this when I was working on my parents living room. They have wood beams that run the length of the vaulted ceilings, and unfortunately someone had done a crappy paint job on the walls at some point. During which, they got paint all over the beams closest to the walls. So I took the time to strip the paint off and restain the beams. And boy are they beautiful now! But I must warn you, this is heavy and dangerous stuff. 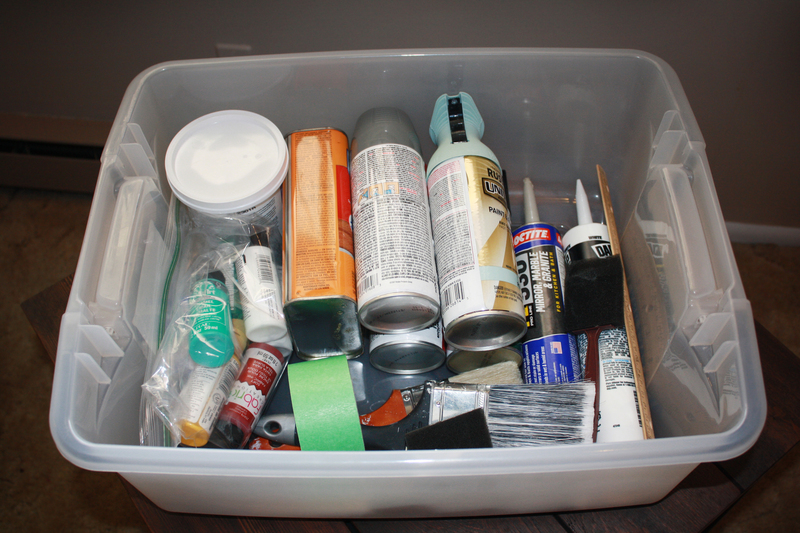 Make sure you follow any and all safety precautions on the container when using paint stripper. Non-Sanded Tile Grout – This is for a project I’m currently working on. (The Mirror Mosaic) Which, I have still yet to finish because of the many complications that I’ve come across. But no worries, it will be done soon! Painter’s Tape – No one likes a sloppy job. That’s why whenever I need a straight line, I use painter’s tape. Painter’s Calk – This is great for creating seamless lines on many surfaces. Just make sure that you get the right kind for your project. Alway read the labels. And keep in mind that not every kind can be painted over. Various Paints – The plastic bag contains many colors and types from other small projects. Including, fabric paint, acrylic paint, and enamel paint. most were bought for small projects, but since there is product left in the bottles, I’m keeping them. Mirror Glue – This was also bought for the mosaic project. And this is great stuff! Holds extremely well, and wont erode the silver from the back of the mirror! Various Small Tools – This includes things such as paint brushes, big erasers, a ruler, and foam brushes. Of course, my collection of supplies will continue to grow. But it’s extremely important not to let products go to waste or throw them away when they could still have a purpose sometime down the line. And ALWAYS ALWAYS ALWAYS recycle empty bottles and packaging when you can. Months down the line, I’ll do an updated post on my supply box. Leave a comment, hit subscribe, and let me know if you use any of these products!